The Twelve Days of Christmas get an upgrade with our first ever Twelve Days of Christmas Savings starting today! 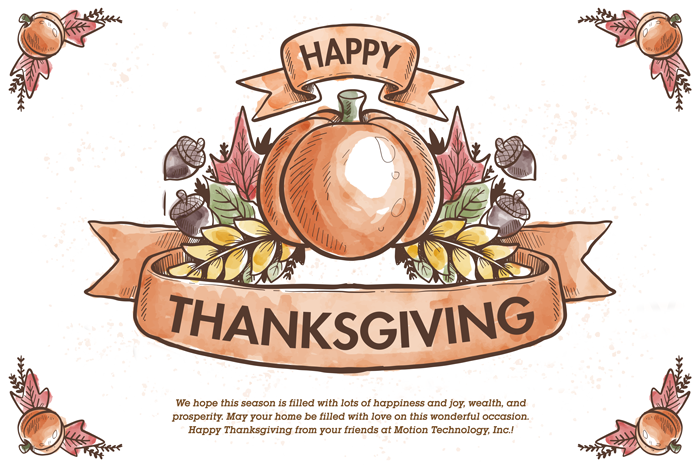 On the first day of Christmas, my true love gave to me: a partridge in a pear tree… If that isn’t the weirdest gift to give your true love – I don’t know what is! Seriously, this song is crazy on so many levels – why do you need eight maids a milking? Or ten lords a leaping?! The only gift that his love may actually want is those five golden rings! So this year, we’re thinking more practically – we asked ourselves, what are the things that our customers want for Christmas? The result is our Twelve Days of Christmas Savings running today through Christmas! 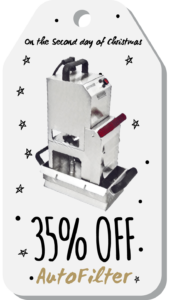 You’ll save up to 35% on the accessories you love for your AutoFry, ventless fryer. Each day we’ll add something new to the sale, making it even better than the day before! At the end of all twelve days you’ll have our largest sale to date – but don’t wait to buy, just like the Christmas cookies you leave out for Santa, this sale won’t last long! Do a lot of business? Don’t let your fries go cold – our heat lamps are built to attach right onto the side of your AutoFry for the ultimate in serving ease. 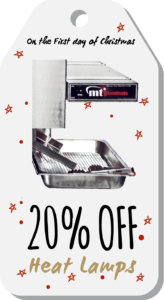 This first day of Christmas savings allows you to serve more people in less time by holding fries as they come out of your fryer, and at 20% off, improving your throughput has never been so affordable! Purchase your Heat Lamps here! I’ve written numerous blogs about the AutoFilter, so I won’t go on forever, but let me just say this: if you could cut your spending on fryer oil by up to 50%, why wouldn’t you? AutoFilter makes your life easier and your wallet fatter, and for a limited time it’s 35% off – a savings of over $700! Purchase your AutoFilter here! 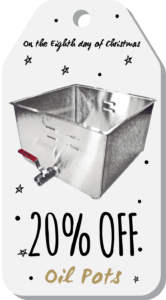 If you’re going to buy an AutoFilter, you might as well save an additional 20% on the AutoFilter filters to go with your new filtering unit. These filters can be used multiple times before replacing and provide a real value for your dollar. Purchase your AutoFilter Filters here! Ok, so you’re still not sold on automatic filtering? The MirOil filter system is your automatic alternative for easy filtering of your oil. 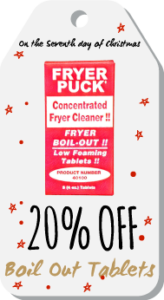 Since oil should be filtered daily to maintain a fresh food taste, you’ll find the MirOil filter system to be a great value – especially at 20% off! Purchase your MirOil Filter System here! No one said every day of saving would be glamorous! The drain hose may not be the flashiest item on your Christmas list, but it’s a valuable tool in the filtering process. 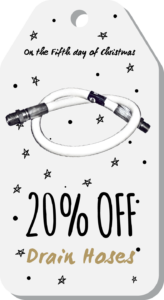 Also at 20% off, this hose is the perfect companion to day four of Christmas savings! Purchase your Drain Hose here! 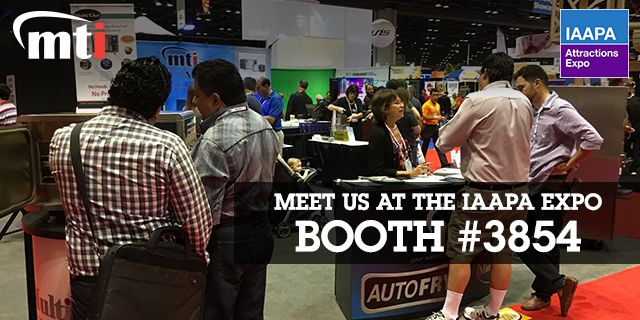 When it comes to keeping your AutoFry clean, nothing works better than our lineup of cleaners. 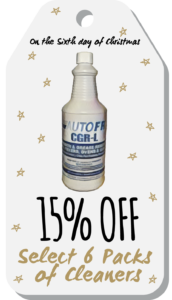 Carefully selected to clean your fryer without damaging it, our CGR-L, CGR-100 and Natforce cleaners make fryer maintenance a breeze – especially at 15% off! Purchase your 6 Pack of Cleaner here! As you clean your fryer on day six, it may become apparent that your oil pot could use a deep clean. Look no further than our boil out tablets. Food can only taste as good as the thing it’s being cooked in, so why cook in a dirty oil pot? 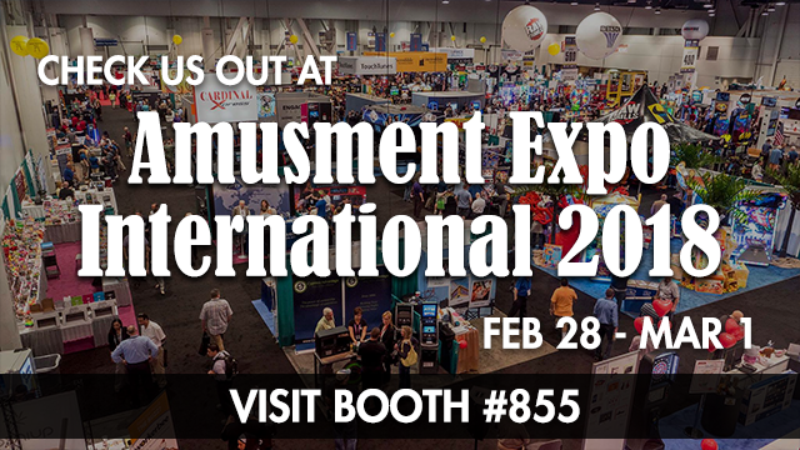 To learn more about our tablets, check this blog out here! Purchase your Boil Out Tablets here! Speaking of cleaning, what do you do when you need to clean your oil pot and still serve your customers? 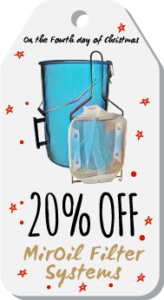 Don’t keep them waiting while you clean out your oil pot, with our 20% off discount on oil pots you can purchase a spare pot to swap out for easier cleaning. Purchase your Oil Pots here! A spare basket is another way to make those mid-day cleanings a breeze. No need to put frying at a standstill when you can simply swap out a dirty basket for a clean one. 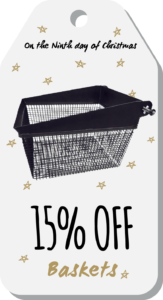 Now is the time to purchase a spare basket while they’re 15% off for our 12 days of savings. 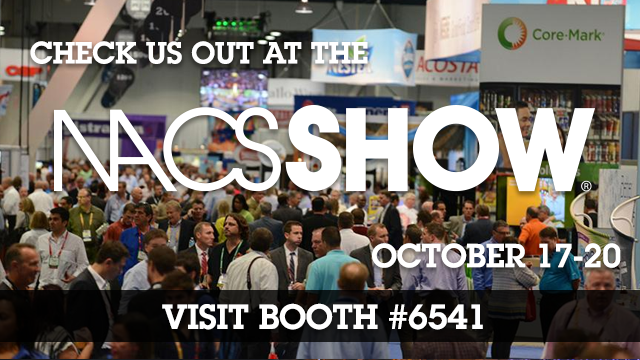 Purchase your Baskets here! You know you’re going to need them – so why not save on purchasing? 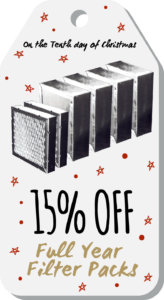 The AutoFry filter packs are your best value when compared to buying each filter individually – and now you can save an additional 15% on each filter pack! Changing your filters is an imperative part of fryer maintenance – check out our filter reminder program for additional filter changing assistance. Purchase your Full Year Filter Packs here! When you’ve got 20 year old AutoFry units still in operation, you begin to think about maintenance in a preventative point of view. Fans are one part that, over long periods of time, will need to be replaced. Rather than have down time, wouldn’t it be nice to have your replacement fan on hand? For 20% off, now is the perfect time to start thinking about preventative maintenance. 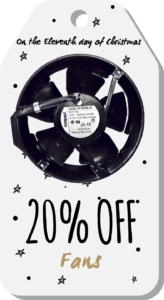 Purchase your Fans here! Just like fans, motors are another excellent preventative part to stock up on while they’re at a discount. 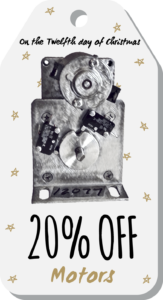 Not only will you save 20% on your Motor during the 12 days of Christmas savings, but you’ll also save yourself money in the long run by not having down time due to motor break down. If your fryer is in it for the long haul, preventative maintenance is the best way to keep your AutoFry up and running for 20 years and beyond! Purchase your Motors here! 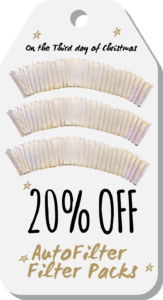 And there you have it –Twelve glorious days of Christmas savings! We’ve got you covered from filtering, to cleaning all the way to preventative maintenance! These deals won’t last beyond the holidays, so act now and save on the items you know and love, from a brand you can trust.